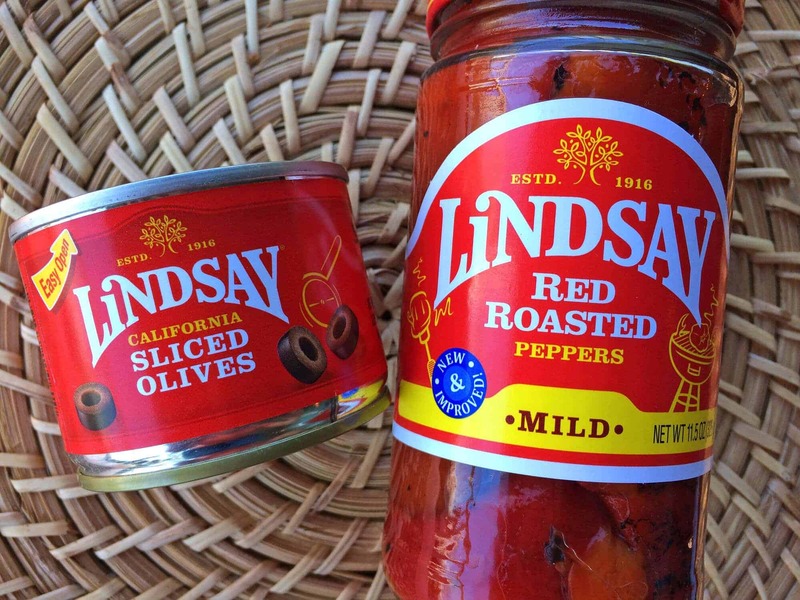 Thank you to Lindsay® for sponsoring this post! 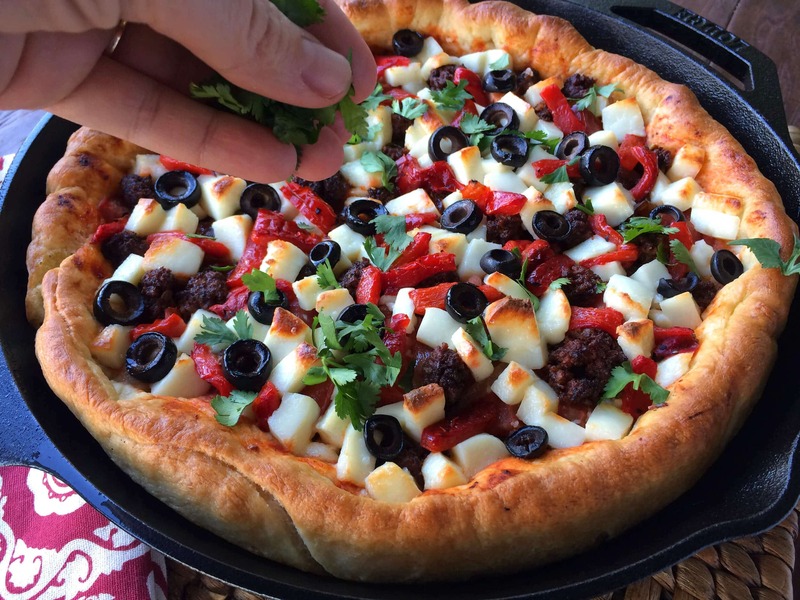 Have you ever tried making pizza in a cast iron skillet? If not, you’re in for a real treat. 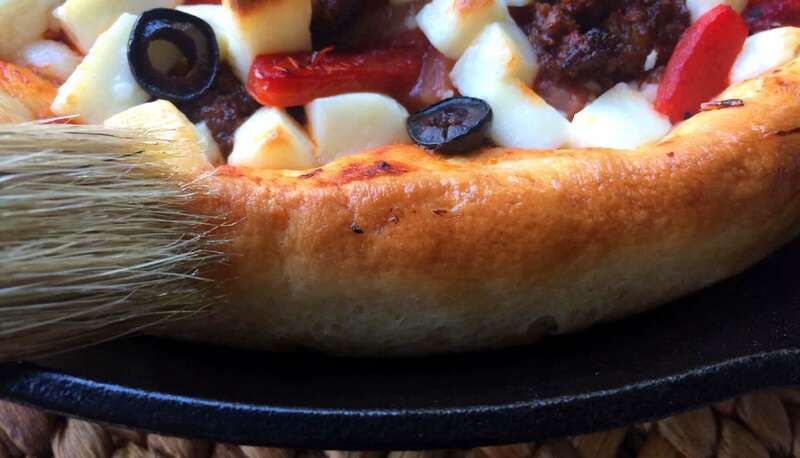 The crust on this pizza is simply awesome. 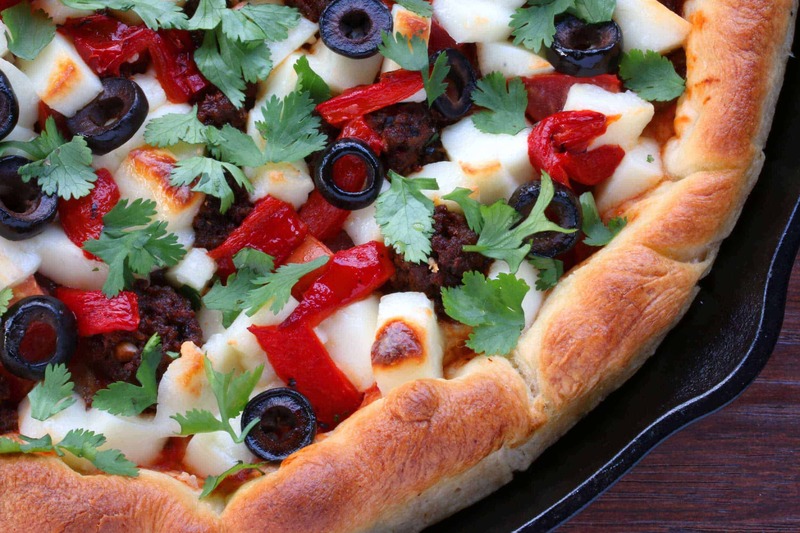 You’re also in for a real flavor explosion with this Mexican-inspired deep dish pizza! And no, those aren’t roasted marshmallows on the pizza, it’s something wonderful called Queso Fresco, a fresh whole milk Mexican cheese. I guess if it gives you that nice and cozy campfire feel, go ahead and think of it like a savory version of marshmallows – delightfully singed golden-brown on the outside and slightly oozing on the inside. Dang, it’s good stuff! Pizza’s always a welcome dish, whether it’s for a casual family dinner, a gathering of friends, or for Game Day. 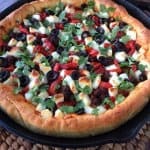 You can make any size you want: A larger 12-inch cast iron skillet will make a deep dish pizza that will easily serve 4 or you can use a 6-inch skillet to make singles (and then some), which is always fun. Of course if they insist on a 12-inch’er all to themselves, you can do that too, huzzah! Just be prepared with a stretcher on hand. Whether you prefer a thick or a thin crust, this is fully customizable and the cast iron skillet method is perfect for either. Want a thinner crust? Use a large skillet or simply use less of the dough. Want a thick crust? Use the 12-inch skillet recommended. 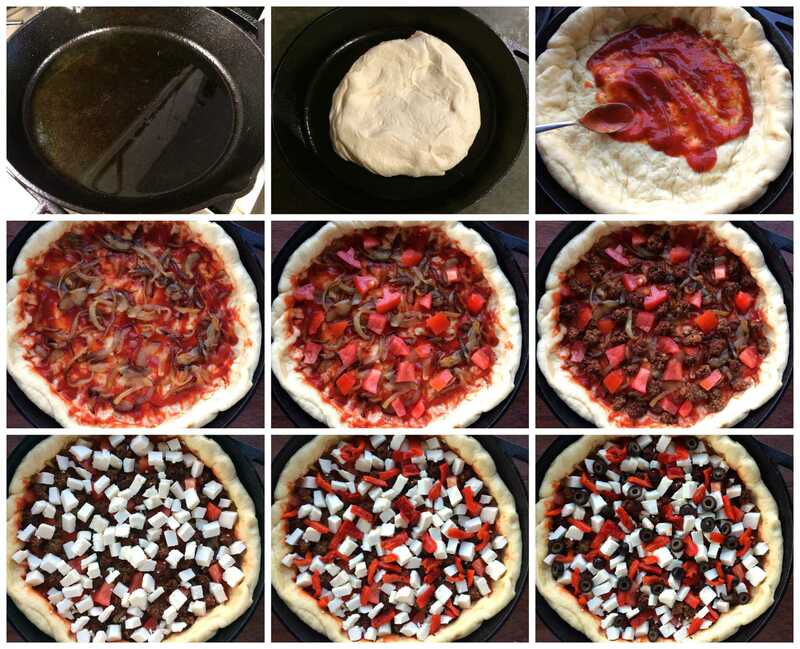 And as I already mentioned, you can make singles 6-inch pizzas by simply halving the recipe. 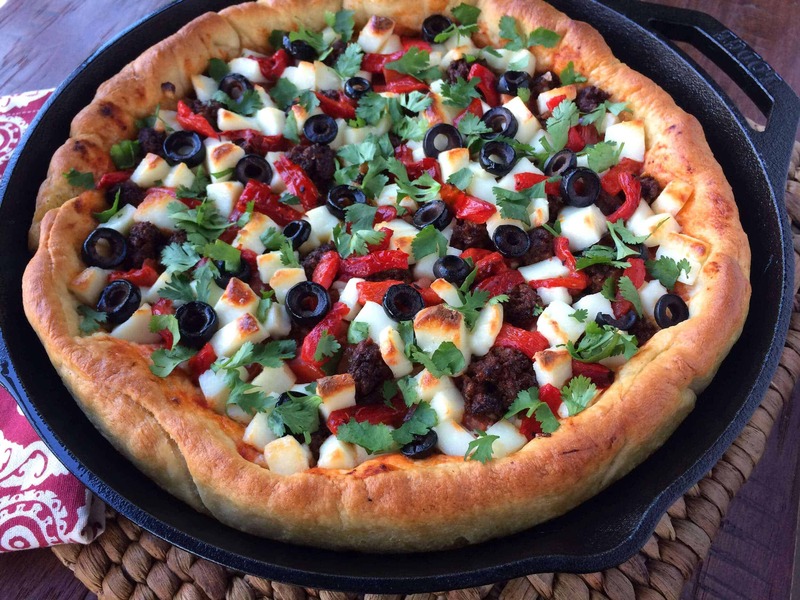 Whichever way you go, you’re going to love how easy this crust is to make, its incredible texture and the powerhouse of flavors packed into this cast iron skillet Mexican-style pizza! I can hardly believe this month marks the 1-year anniversary of my brand ambassadorship with Lindsay® in celebration of their 100th anniversary! Where did last twelve months go?? Well, at least part of them were dedicated to creating some amazing dishes. I had the privilege of sitting down with pen and paper, closing my eyes and letting my mind run free; dreaming of the places I’ve visited, the foods I’ve tasted, and imagining the dishes I could create from a few these countries using a handful of ingredients that so many of these nations share in common: Olives, peppers, capers, pimientos….And then I got to go to work creating original recipes blending these ingredients with some of the great cuisines of the world. Among the areas I represented are Sicily; Morocco; Portugal; California; Greece; Liguria (Italy); Cuba; Mexico; France; and Spain. My resulting work are the twelve dishes below. Really, I have the best job in the world! 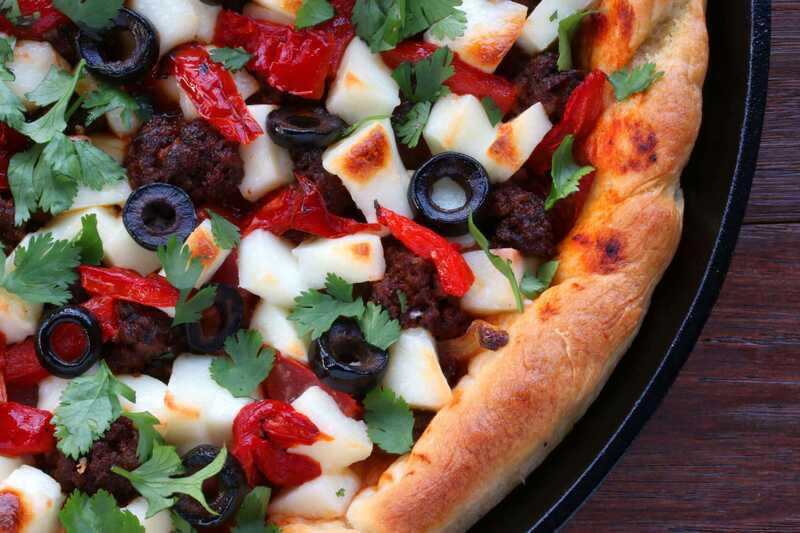 So let’s focus on today’s dish: Our Mexican-inspired pizza. I wanted something really flavorful and the first thing that came to mind was chorizo. If you really want it to taste amazing, make your own – it is super duper quick and easy and you can freeze it so you can always have it on hand. 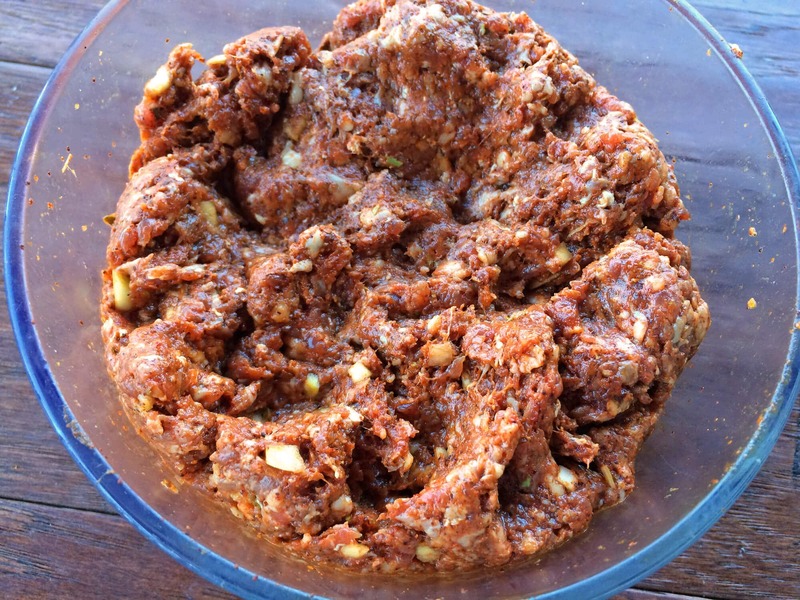 Here is my recipe for Easy Homemade Chorizo. Trust me, you have to make it. Ignore how unappetizing it looks. Sometimes looks really are overrated. Mexican chorizo is the poster child for this truth. In that recipe post for homemade chorizo you’ll also read about the tragic ending of my relationship with store-bought chorizo and hear me sing a sad love song over the breakup. Yeah, it’s pretty dramatic. I’m finally over it. I wanted to avoid the typical mozzarella and Mexican cheese blend options so I went for something more traditionally Mexican. Queso fresco, a fresh whole milk cheese. It was the perfect choice for this pizza. 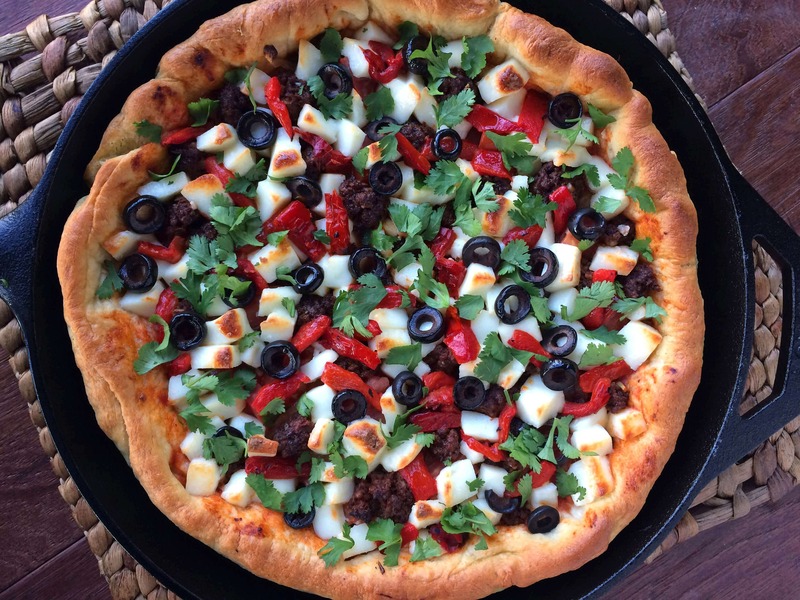 Some other touches include roasted red peppers for color and a wonderful smoky flavor dimension that echo the spicy notes in the chorizo, some sliced black olives, caramelized onions (those make practically anything taste better) and fresh cilantro. The next thing I was after was a great crust and so I used a cast iron skillet. I drizzled the bottom of the skillet with olive oil before laying down the dough. That accomplished two things: It allowed the oil to penetrate the crust while baking to infuse it with flavor and moistness while simultaneously creating a wonderfully crispy bottom and chewy interior. Plus it just looks really cool. The cast iron skillet approach also allows you to pile in the ingredients for an awesome deep-dish pizza. Yummmm. Prepare the dough by dissolving the yeast and sugar in the warm water and letting it sit for 5-10 minutes or until frothy. Place the flour and salt in the bowl of a stand mixer attached with a dough hook and create a well in the center. Pour the yeast mixture into the well along with the olive oil. Knead on the “bread” setting (“2”) until the mixture comes together and then knead for another 3-5 minutes or until the dough comes together in a ball. Lift the ball out, spray the bowl with some olive oil, place the ball back in the bowl and cover loosely with plastic wrap. Let it sit in a warm place for 30 minutes. The dough is ready. Pour a couple of tablespoons of olive oil into a 12-inch cast iron skillet (I use and like this skillet from Lodge). Place the dough in it and use your fingers to spread the dough evenly across the pan and up the sides. Let it sit for a couple of minutes before you add the fillings then stretch the dough back into place as needed. Cover loosely with plastic wrap and let it sit in a warm place for another 10 minutes. Spread on the tomato sauce. 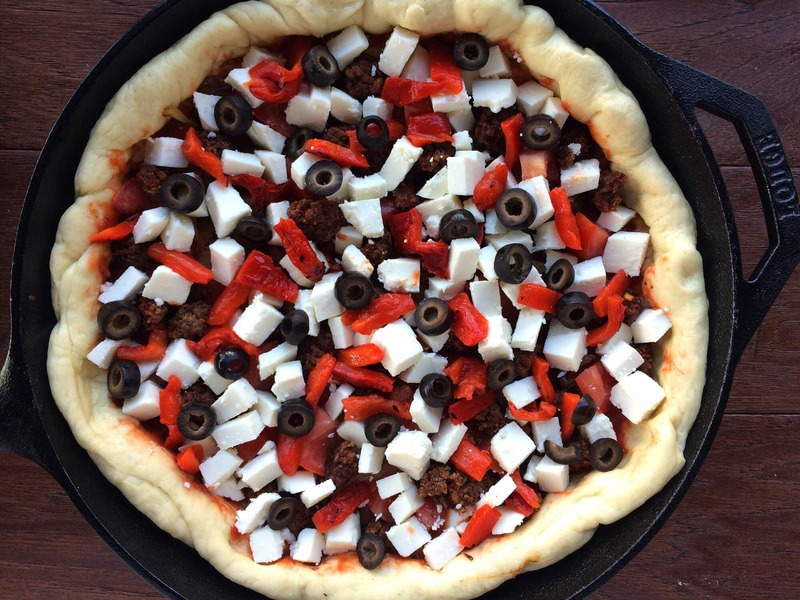 Add the toppings: Caramelized onions, tomatoes, chorizo, queso fresco, roasted red peppers, black olives. The pizza is ready for the oven. Bake it on the middle rack in the oven preheated to 450 degrees F for about 15 minutes or until the crust is nicely browned. As soon as it comes out of the oven, brush the crust with some olive oil. If you prefer, you can also brush it with your favorite garlic butter. Let the pizza sit for 5 minutes then sprinkle with some chopped cilantro. The pizza will easily slide right out of the pan. Transfer it to a platter to cut and serve or cut it in the pan and serve. Make this and your taste buds will thank you! To make the pizza crust: Prepare the dough by dissolving the yeast and sugar in the warm water and letting it sit for 5-10 minutes or until frothy. Place the flour and salt in the bowl of a stand mixer attached with a dough hook and create a well in the center. Pour the yeast mixture into the well along with the olive oil. Knead on the "bread" setting ("2") until the mixture comes together and then knead for another 3-5 minutes or until the dough comes together in a ball. Lift the ball out, spray the bowl with some olive oil, place the ball back in the bowl and cover loosely with plastic wrap. Let it sit in a warm place for 30 minutes. The dough is ready. During the last few minutes of rising, preheat the oven to 450 degrees F.
To make the pizza: Pour a couple of tablespoons of olive oil into a 12-inch cast iron skillet (get a little of the oil up the sides of the pan as well). Place the dough in it and use your fingers to spread the dough evenly across the pan and up the sides. Let it sit for a couple of minutes before you add the fillings then stretch the dough back into place as needed. Cover loosely with plastic wrap and let it sit in a warm place for another 10 minutes. Bake it on the middle oven rack for about 15 minutes or until the crust is nicely browned. As soon as it comes out of the oven, brush the crust with some olive oil. If you prefer, you can also brush it with your favorite garlic butter. *This is for a THICK CRUST. If you prefer a thinner crust simply use a little less dough or use a larger pan. *The caramelized onions and chorizo can be prepared either well ahead of time and refrigerated until ready to use, or they can be made while the dough is rising, hence the 15 minute cook time (for the pizza only). The dough can also be made in advance, wrapped in plastic wrap and refrigerated until ready to use. Let it sit at room temperature for 30 minutes before using. 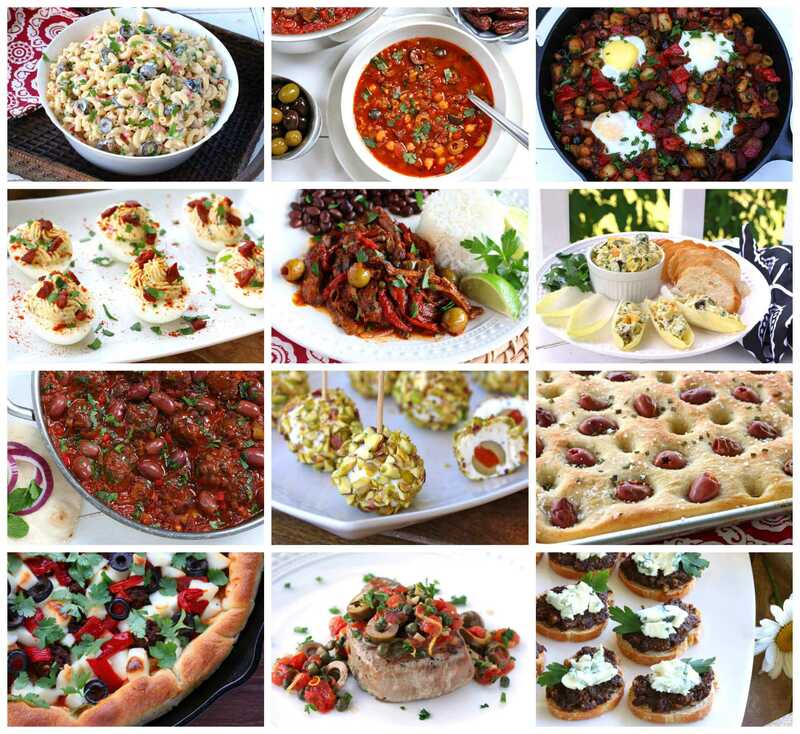 Thank you to Lindsay® for sponsoring this post and to my readers for supporting the brands that make The Daring Gourmet possible! I make pizza all of the time but have never made it in my cast iron. I love it! I am going to try that! I’m crazy about Mexican food, and I would love a big slice of this pizza! Love that you made it in a skillet, too! Oh my goodness! Now THIS is my kind of pizza! I have never thought about doing it in my cast iron! What a great idea! Funny that you felt a need to say those weren’t marshmallows on your pizza. Made me laugh, and kind of cringe at the thought it. LOL. This pizza looks incredible. Can’t wait to try it. I need to try a baking in a cast iron skillet! The thick crust looks amazing and so soft! YUM! 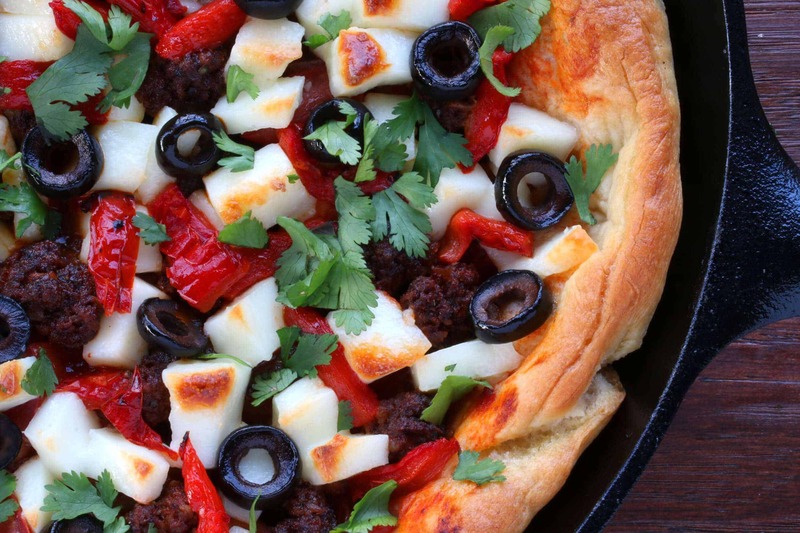 We love making pizza in a cast iron skillet, and I love this Mexican twist on the classic. That queso fresco just looks divine! Two of my very favorite things in one dish! Best pizza ever! Who needs delivery when you have this as an option! Wow – what an amazing looking pizza! I love that deep dish crust!! This deep dish pizza looks incredible! I love the Mexican flavor twist on pizza! What a great idea for using my lodge pan, my kids would be delighted to eat this. I will have to do without the queso fresco though, that is not available here. And I have never thought about making my own chorizo, I wonder how that is, the one I buy from time to time is not exactly the Brüller. YES YES YES! Look at all of the colors on that pizza! This thing is packed with flavor! Absolutely DELICIOUS!!! I made this yesterday and my boys (husband and 2 sons) devoured the whole thing in minutes. And now they’re asking for more :) Thank you for this awesome recipe! Fantastic, Tanya, I’m so glad it was a hit – thank you! Odd instructions that say to brush the crust with olive oil after baking. Well, color me stupid, but the sauce and toppings are already baked on so how is one supposed to brush the crust with oil? Robin, take a look at the picture in the step-by-step instructions for a visual reference. The crust, meaning the exposed rim of the crust. Hi Judy, I haven’t tried freezing this particular dough but the feedback I’ve gotten is that it can be frozen but the texture of the baked crust won’t be quite as crispy. No stand mixer here – can I knead the dough by hand instead? Yes you can, Jenn – knead it by hand for 10-12 minutes.